Jennifer Egan writes a lot. As a novelist, short story writer, and journalist, she’s written for the New Yorker, New York Times Magazine, and Harper’s, and has put out several books. Her latest, A Visit From The Goon Squad, is a sharp and savvy series of interlocking narratives about time, class, and the music industry, and last month, it won the Pulitzer Prize for fiction. The A.V. Club talked to Egan, who will be reading at Penn’s Kelly Writers House for alumni weekend, about awards, bad writing, and growing up punk. The A.V. Club: What’s your writing process actually like? How do your ideas get from you to a book? 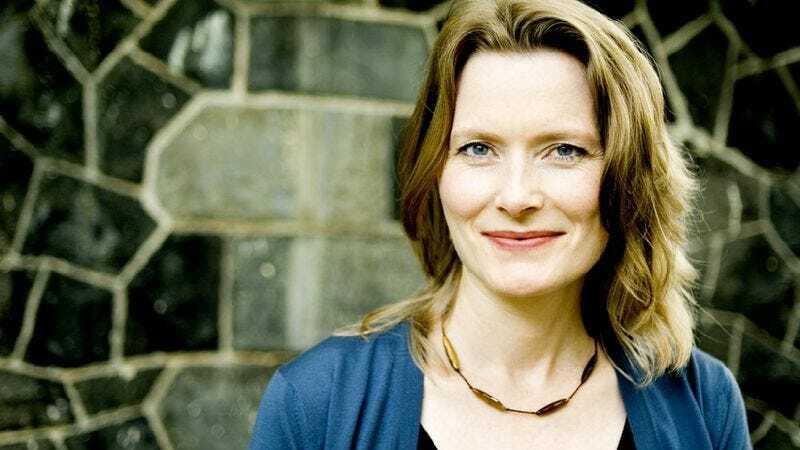 Jennifer Egan: I feel like I’ve done so little fiction writing lately that I’m talking hypothetically, but the method when I’m working… I write my first draft by hand, at least for fiction. For non-fiction, I write happily on a computer, but for fiction I write by hand, because I’m trying to achieve a kind of thoughtless state, or an unconscious instinctive state. I’m not reading what I write when I wrote. It’s an unconscious outpouring that’s a mess, and it’s many, many steps away from anything anyone would want to read. Creating that way seems to generate the most interesting material for me to work with, though. I do five to seven pages a day in a legal pad, which can take hours to do or go very quickly. The best hours for me to work are in the morning. Once I have the draft, it’s like 20 or 30 legal pads, and I type it into the computer. The Goon Squad, I wrote in pieces, so it wasn’t like that, but, generally. I type it in, and then I read it. I try to figure out what it seems to be and how I can make it be that thing more fully. I try to fulfill the best possibility for whatever it is. That’s when I work from outlines and get very systematic in my planning. I still write by hand—well, edit by hand on hard copies. That I can do for more hours than I can spend generating material, which I get pretty depleted doing. Editing, I can do for hours if I have them. I can do it at other times of the day, too. I can just jump in. I generally have a big vision that I’m trying to work with, whereas when I’m trying to find my way into it, I can only do that in smaller chunks. AVC: Is that how you’ve always written, or is this a system that’s come with experience? JE: It’s pretty much the way I’ve always written. I’ve tried variance, but basically that’s what seems to work best. I’ve tried writing on a computer thinking it would make me more efficient, but if you’re writing crummy stuff, being efficient is no help. It’s only changed over the years to the extent that I’ve identified it and have come to honor it a little more than trying to work against it, like “C’mon, there’s got to be a better way to do this.” If you can write any way and it’s working out, just bow down in gratitude. Don’t mix it up. Just be happy. It’s hard to do anything decent. AVC: A lot of praise for this book has said that it’s perfectly written for the Internet generation, which you’ve said you didn’t intend to do. Even so, do you think that’s apt? JE: I wasn’t consciously thinking of that as a metaphor, but it excited me to write that way, because I kind of felt an echo in that structure with what I was doing online. Technology interests me a lot as a writer, though not much as a consumer. My last novel, The Keep, was very explicitly technological, about the quality of living in a state constantly surrounded by disembodied presences, and I was thinking very much about the online experience. This one, I wasn’t, but none of us can get away from that kind of amazement or excitement—or for some people, horror—at how much it’s changed the way we operate. A sense of that kind of narrative movement that we experience online could have been in my mind easily, though not consciously. I do rely so much on my unconscious, the way I write my stuff the way I do. I let my unconscious work. I have better ideas that way and more interesting work. AVC: You’re great at details about people’s characters and interpersonal relationships. Do you think, as a writer, you notice more of that stuff in your every day life than the average person, or that you’re just better at making it up? JE: I don’t know. The average person might articulate them differently, but we all think about interpersonal relationships in one way or another. Writers just express that in different ways and capture it in different ways. To some degree, we’re all thinking about the same things. It’s the zeitgeist. The trick, in a way, as a writer, is to hope that your interests in some sense link up with the culture around you. AVC: This book is, at least in part, sort of centered on the music industry. Why? JE: A lot of reasons, actually. I didn’t decide to set it there from the start, and I later asked myself the same question, though. Like, how is it that it became so important? I think on the most basic level, I wanted to learn about the industry. As a journalist, I hoped to get assignments that would lead me there, but that never really happened. The magazine I tend to write for (The New York Times Magazine) has a great industry reporter, Lynn Hirschberg, who had that covered, so there was just no need for me to go there. I had no contacts there. The book is about time and change, though, and I knew from the beginning that it would involve the music industry because, well, transformed’s not the right word, but it’s not clear where music’s going. It was decimated by the move to digital technology, and so it’s a natural lens to look at the changes in technology even 30 years ago. I was also influenced by a piece I read in Harper’s by Neil Young 30 years ago when digitization was just happening and people were buying and selling CDs. He was just horrified by the quality of the sound and—I’ve never looked at the article again, by the way—he thought CDs were cold and perfect, but just kind of dead, without a soul. He questioned whether aesthetically the business would ever recover. I guess the idea that a musician would react to the quality of digitized sound that way stayed with me, and it’s a horror I ended up infusing in Bennie [in the novel]. Another reason I think is important is that music and time have a very interesting relationship. There’s nothing that makes one feel transported to earlier periods in their lives more than music. People define themselves to some degree by the music that they listened to as teens. My mom had Elvis. Me, I had The Who and later punk rock. Kids who came up in the ’80s had other songs and bands. It’s a way of placing ourselves culturally and temporally. AVC: How did you do your music industry research? Did you go to labels? Watch movies? JE: I had a friend dating someone in a band, and they were coming to New York on tour, and we were supposed to go backstage, but it never came to pass. I didn’t really need to do that much, though. The punk stuff in the late ’70s, I experienced, so that was pure memory and YouTube to refresh those memories. I read a number of books about the music industry, and some articles. Lynn Hirschberg actually wrote some pieces that were really helpful to me, like she did one about Rick Rubin that captured him really well. I did spend a lot of time on the phone talking with a mixer and producer, talking about the actual technology of the whole thing, like the difference between analog and digital sound that I didn’t understand. Just the nuts and bolts, journalist stuff. I didn’t need to do that much, though. I had a lot of my own memories to draw upon, and there’s not that much technical in the book. People say I’ve done my research, though, so that’s a good feeling. AVC: You’re probably going to be speaking to more than a few young hopefuls at Penn. What’s your advice for aspiring authors? JE: My advice is pretty basic, and it’s what I try to follow myself. The number one thing is read. We live in a moment and a culture when reading is really endangered. There’s simply no way to write well, though, if you’re not reading well. Number two and number three are connected. Two is make writing a habit. There’s sometimes this sense of waiting for the right time to write, and boy, it never happens. There is no right time. It’s like having kids. You just have to decide to do it. Number three, which is connected to that, is the one I find myself saying the most often and that I’m a huge believer in. It’s that it’s okay to write badly. Writing badly gets you to all the good stuff. We’re all afraid of writing badly, and there are psychological reasons, like the bad interior of ourselves is somehow being revealed, but we all fear that, and you can’t write well if you’re not willing to write badly. That’s why you have to make writing a habit, so it feels normal and not strange. That’s so critical, and the only way to do that is sometimes to just write badly. It’s like daily physical labor, like exercise. That being said, I haven’t written in days. Clearly, I need to be giving myself this advice.